The solar inverter market in Vietnam is predicted to register major boom over the coming years. This boom is a result of the introduction of Vietnamese government's Decree No.11/2017/QD-TTg, which has provided the regulatory framework required by the country to develop the production of solar energy. As of July 2018, projects with a total capacity of 12,600 MW were in the pre-investment phase, projects with a cumulative capacity of 1,400 MW were in the development and feasibility phases while over 1,000 MW were under construction. The solar inverter market of Vietnam is expected to grow substantially in the initial years of the forecast period on the back of favorable response received from the investors in solar market. The market is expected to stabilize during the latter part of the period. The Southern region held the highest Vietnam solar inverter market share. Further, the region has the highest potential for solar energy as it is situated near the equator and most of the upcoming projects are concentrated in the Southern region of Vietnam. The Vietnam solar inverter market report thoroughly covers solar inverter market by power rating, types, verticals and regions. 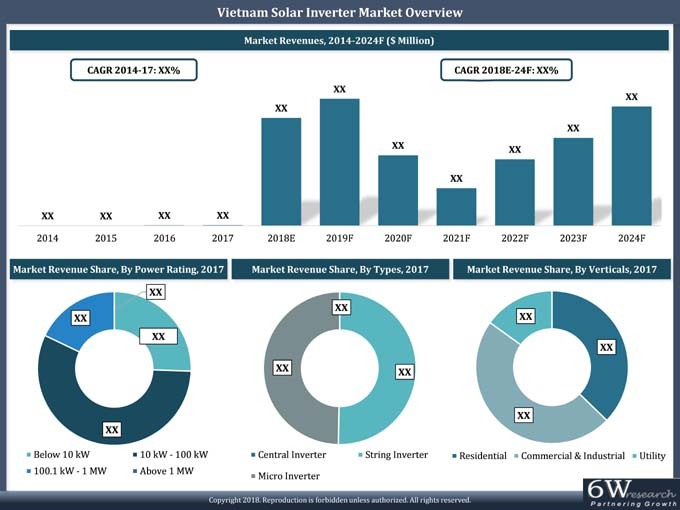 The Vietnam solar inverter market outlook report provides an unbiased and detailed analysis of the Vietnam solar inverter market trends, opportunities/high growth areas and market drivers, which would help the stakeholders to device and align market strategies according to the current and future market dynamics. •	Historical Data of Vietnam Solar Inverter Market Revenues and volume for the Period, 2014-2017. •	Vietnam Solar Inverter Market Size & Vietnam Solar Inverter Market Forecast, During 2018-2024F. •	Historical Data of Vietnam Solar Inverter Market Revenues and volume by power rating for the Period, 2014-2017. •	Historical Data of Vietnam Solar Inverter Market Revenues by types for the Period, 2014-2017. •	Market Size & Forecast of Vietnam Solar Inverter Market Revenues by types for the Period, 2018-2024F. •	Historical Data of Vietnam Solar Inverter Market Revenues by Verticals for the Period, 2014-2017. •	Market Size & Forecast of Vietnam Solar Inverter Market Revenues by Verticals for the Period, 2018-2024F. •	Historical Data of Vietnam Solar Inverter Market Revenues by regions for the Period, 2014-2017. •	Market Size & Forecast of Vietnam Solar Inverter Market by regions for the Period, 2018-2024F. 14.2 Jiangsu Goodwe Power Supply Technology Ltd.
14.8 Sungrow Power Supply Co., Ltd.
14.9 SolaX Power Co., Ltd.